What is the factory warranty on cluster box units? The factory extends a five year warranty on cluster box units. Can you key the master door locks alike for my multiple unit order of front loading private use horizontal mailboxes? Yes, please specify that you would like USA Building Supplies to do this at the time of your order. How many rack ladder horizontal mailboxes fit into a rack ladder mounting system? Five rack ladder horizontal mailboxes fit into a rack ladder mounting system. Two rack ladders will be needed for the first column of mailboxes and one additional rack ladder will be needed for any additional columns of mailboxes after that. Can the access door for the front loading horizontal mailboxes be used by a tenant? No, the access door on front loading horizontal mailboxes is reserved as a master entry door. Will USA Building Supplies accept a government purchase order? Yes, USA Building Supplies will gladly accept a government purchase order. In addition, USA Building Supplies automatically extends net 30 day terms to all government agencies. What are your letter boxes made of? Letter boxes are made of extruded aluminum. What is the diameter of the holes for the four feet of the courier drop box? The diameter of the courier box feet is 9/16". USA Building Supplies suggests 3/8" bolts for securing the drop box to the concrete. What is the maximum number of tiers vertical mailboxes can be mounted? Vertical mailboxes can be mounted a maximum of two tiers. Are all compartments use able in vertical mailbox clusters? All doors are use able in vertical mailbox clusters. Is hardware included with my 4C horizontal mailbox to install it into a wood framed wall? Yes, hardware for your 4C horizontal mailbox is furnished for this purpose. How much space do I have to allow for the master entry panels on the 4C mailbox to open for the mail carrier to deliver the mail? Per USPS regulations each 4C mailbox master access panel must be allowed to open a minimum of 90 degrees with no obstruction. Is the outgoing mail secure in cluster box units? Yes, the outgoing mail is locked in cluster box units once it has been deposited through the mail slot. What are the dimensions for cluster box unit mail slot? The dimensions for the cluster box mail slots are 11 3/4" wide by 3/4" high. How many keys are furnished for the tenant locks for your vertical mailboxes? Vertical mailboxes come furnished with two keys per tenant lock. How many different sizes do you offer logo floor mats in? Currently, USA Building Supplies offers logo floor mats in eight different sizes. Can I get USPS Approved 4C pedestal mailbox with combination locks for the resident doors? Currently, per postal regulations there is no commercial mailbox that is USPS Approved with tenant combination locks. What tools are needed to replace a tenant lock on my cluster box unit? The tools needed to replace a tenant door lock on a cluster box unit are 1/2" nut driver and a pair of channel locks. Do you install commercial mailboxes? USA Building Supplies does not install commercial mailboxes. Are cell phone lockers included if I purchase a cell phone cabinet enclosure? No, cell phone lockers are sold separately from cell phone cabinet enclosures. Can I get a twelve compatment charging Tek Stak laptop locker? No, currently Tek Stak charging laptop lockers are available in five or ten compartments. Are mail master RMP risers available for legal size mail master mail sorters? Yes, RMP risers are available in both letter and legal depths for mail master mail sorters. Can you custom powder coat a courier box for me? Yes, custom colors are available for courier boxes for an up charge. Please contact USA Building Supplies for a quotation. If I choose engraved door identification for my cell phone locker, will the cardholder door id be on the user door too? No, if you select engraved door identification for your cell phone lockers, that will be the only door id on your user doors. Yes, open back mail master mail sorters have a 1/2" lip on both sides of each shelf for pocket opening identification. If I order a cluster box unit without the pedestal, do I get a price reduction? Yes, USA Building Supplies will be happy to provide you with a discounted price for a cluster box without a pedestal. If we have a leasing office open Monday through Saturday during normal business hours with the ability to accept packages on behalf of the residents, do we still have to adhere to the package locker requirement for our new 4C mailboxes? There is a provision in postal regulation USPS-STD-4C that does allow the local Post Office to grant exceptions if someone is on site to accept packages. However, USA Building Supplies advises clients that are ordering 4C mailboxes to check with the local delivring Post Office before ordering their 4C mailboxes. Is there an additional cost to having my laptop lockers ship on lift gate truck for easier delivery? Yes, there will be an additional cost for shipping your laptop lockers on a lift gate truck. A USA Building Supplies' representative will be happy to communicate the cost for a lift gate truck versus a standard freight truck. How quick can you get a cluster box unit to me? Cluster box units with standard door id in sandstone finish typically ship in one to three business days from the factory. Transit times for shipment will vary upon your location, whether you are a commercial or residential address, and if special freight services are needed. A USA Building Supplies' representative will be happy to try to expedite your shipment and freight, but there may be additional costs for doing so. Are all compartments useable in vertical mailbox clusters? All doors are useable in vertical mailbox clusters. How much space do I have to allow for the master entry panels on the 4C mailbox to open for the mail carrier to deliver the mail?Per USPS regulations each 4C mailbox master access panel must be allowed to open a minimum of 90 degrees with no obstruction. Are pedestals included in your pricing for 4C pedestal mailboxes? 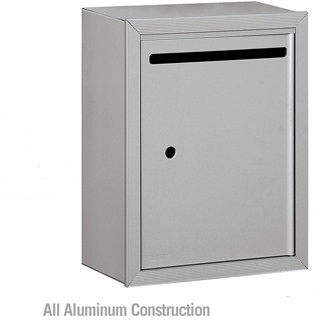 USA Building Supplies includes pedestals in all of our pricing for 4C pedestal mailboxes. How long does it take for my cell phone locker to ship? Cell phone lockers typically ship from the factory in about two weeks. The local Post office says that I need a type III cluster box unit, what does that mean? Type III cluster box unit is term used in the commercial mailbox industry meaning a 16 door cluster box unit. How many keys come with each resident lock for my cluster box unit? Each cluster box unit tenant lock comes with three keys. just received my 12 door cluster box unit shipment and the mail receptacle has a drill hole in the outgoing mail comparrtment and the big door on the bottom of the unit, is this right? The cluster box unit was shipped correctly if it is being used for U.S.Mail delivery. Due to security reasons, the USPS will not allow the commercial mailbox manufacturers to have their master arrow locks, however the factory is provided the specification for the arrow lock so the Postal Service can install the master lock efficiently in the field. The 12 door cluster box requires an arrow lock to be installed on the outgoing mail master access door comparment and the parcel locker door. What material are your cell phone lockers made of? Cell phone lockers are made of aluminum. How many dials does your resetable combination locks have for your cell phone lockers? The cell phone locker resetable combination locks have four dials. Someone scratched my pedestal mailbox, can you provide me with touch up paint? Yes, please call USA Building Supplies and we will be happy to help you get the proper touch up paint for your pedestal mailbox. Does the Roadside locking mailbox have an outgoing mail area? Yes, the Roadside locking mailbox has a mail tray that is 10 inches wide by 1 3/4 inches high. Outgoing mail for single unit locking mailboxes is not secure per postal regulations. Which toilet tissue dispenser do you recommend for high traffic facilities? USA Building Supplies suggests that you take a look at the Twin 9" Jumbo Toilet Tissue Dispenser. I am looking for an indoor entrance mat for my company's main entryway that will do the job and is attractive, can you help? USA Building Supplies suggests that you take a look at the Aroow Trax entrance mats for this application. I am looking for some matting for my locker room which has showers and a steam room, what do you recommend? USA Building Supplies would suggest that you take a look at the safety grid mats. This anti-fatigue mat is often used for this application. Do you have a product to protect people at my facility who are using ramps and walkways from slipping when they are entering or leaving my building? USA Building Supplies recommends that you look at our safety trax mats for this purpose. I am locking to order ten key control cabinets, can you key the locks alike for all of the cabinets? Yes, USA Building Supplies can have the factory key alike the locks for your key control cabinets. There is typically an up charge for doing this. Please call USA Building Supplies' national customer service center for a quote. Can someone just pick up my courier box and put it in a truck and drive off? The courier package drop box should be anchored into the concrete if installed properly, which should be enough to discourage someone from doing this. Are pedestals included in your pricing for cluster box units? Yes, pedestals are included in USA Building Supplies' pricing for all cluster box units. Why do you have the 4C pedestal mailboxes organized in terms of unit height on your website? USA Building Supplies has organized the 4C pedestal mailboxes in terms of unit height with the idea being that most customers who are purchasing multiple units of this style of pedestal mailbox for one installtion location will want to stay within that grouping for appearance reasons. Please call USA Building Supplies if further clarification is needed. Can you change the location of the access door on the cluster box unit I plan to purchase? No, per USPS regulations the U.S. Postal Service does not allow the factory to modify the configuration of the cluster box unit. I am interested in purchasing a logo mat to help promote safety in my manufacturing facility, can you help? Yes, USA Building Supplies is happy to help. However, we would encourage you to first look at our safety message mats which we have several stock message mats that promote safety. If none of of our message mats fit your requirements, please call USA Building Suppies' national customer service center for assistance. Can I get extra master keys for my cell phone cabinet? Yes, extra master keys are available for purchase when you order your cell phone cabinet for about ten dollars each. 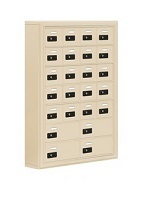 For most cell phone locker orders, USA Building Supplies provides one master key free of charge. Do you have an outdoor cell phone locker? No, all of are cell phone lockers are for indoor use only. Can I order extra locks with my purchase of a 4C pedestal mailbox? Yes, replacement locks for the tenant doors for your $C pedestal mailbox are readily available. The extra locks will come in handy when a resident moves out. Are all of the compartments useable in the front loading brass horizontal mailbox? Yes, two master locks on the brass horizontal mailbox frame act as the access door for this front loading horizontal mail receptacle. Are horizontal mailboxes included with my purchase of a Roll-A-Bout mailbox cabinet? No, horizontal mailboxes must be purchased separately. My rotary mail center will not rotate, can you help? The rortary mail center requires the operator to unlock the unit to rotate the cabinet. If you need further assistance please call USA Building Supplies. Are the dividers adjustable in the high capacity laptop locker? Is the height adjustable for your mailroom tables? The height of a mail master mailroom tables can be adjusted in one inch increments within an eight inch range which covers most circumstances. Can freestanding 4C mailbox enclosures be used outdoors? Yes, stand alone 4C mailbox enclosures can be used outside. I have a parcel locker on the bottom of both sides of my double column 4C mailbox configuration and would like to know how far off the finished floor can I mount the mailbox receptacle? USPS-STD-4C regulation states that no parcel locker compartment (interior bottom shelf) shall be positioned less than fifteen inches off the finished floor. Can the factory prepare the horizontal mailbox that I intend to order for tenant locks that I will provide, so their mailbox compartment is the same as their apartment unit? The factory can prepare tenant doors for customer provided locks on horizontal mailboxes. However, every case is different therefore USA Building Supplies requires a lock sample be provided so the factory can approve it, before producing the commercial mailbox. What is central point delivery? Central point delivery is a term that refers to mail delivery in a residential area where the mail carrier delivers to numerous addresses at one delivery point to typically a commercial mailbox. Can you locate the package lockers in my 4C mailbox configuration at the top of the receptacle? USA Building Supplies advise customers to locate the package lockers at the bottom of the mailbox configuration because it will be easier for the USPS to deliver parcels and the postal customer to retreive the package if it is heavy. I can't find the keys, mating hardware, or the installation instructions for my cluster box unit shipment that just arrived, can you help? The keys, mating hardware, installation instructions, and other small accessory items ship inside your cluster box unit so they do not get misplaced. The inside of the cluster box can be accessed by opening the master door that will not have a lock on it and then by pushing up on the internal compartment lever the front cabinet panels will release like french doors. USA Building Supplies cautions client prior to doing this to be careful, because the cluster mailbox is front heavy and will tend to tip forward. Which anti-fatigue mat do you suggest for assembly line workers? USA Building Supplies would advise you to take a look at the Bubble Trax anti-fatigue mat. Which anti-fatigue mat do you suggest for a welding environment? USA Building Supplies would advise you to take a look at the Dura Trax anti-fatigue mat. Can you send me color chips for your vertical mailboxes? Yes, USA Building Supplies can send you color chips for our vertical mailboxes. Please call or email USA Building Supplies' national customer service center to request them. I plan on ordering a 4C mailbox for private use, can you cut slots in the individual compartment doors? Because your mailbox is for private use, USA Building Supplies can have the factory cut slots in the mailbox doors of your 4C mailbox. Typically, there is an up charge for doing this. Please call USA Building Supplies to receive a quotation. Should I consult with the local Post Office on where I plan to install my cluster box unit before I install it? USA Building Supplies strongly advises clients to communicate on where they hope to install their cluster box unit before purchasing a unit. The Postal Service does have the authority to dictate on where the commercial mailboxes will be installed, however they are usually cooperative. If I order multiple entry panel cell phone cabinets, can I have the master access door locks keyed alike? Yes, USA Building Supplies can key alike the master door locks for customers who order more than one cell phone cabinets at one time. Do I need parcel lockers in the 4C horizontal mailbox configuration I intend to purchase? USPS-STD-4C postal regulation states that there must be one parcel locker for every ten tenants in 4C mailbox installtions. Local postmasters may grant variances in certain circumstances. I am looking for a mail sorter that is open on both ends that I can recess into the wall, can you help? USA Building Supplies mail master mail sorter modules are all offered in open back style which is what you are describing.Please select that option on the product page of the mail sorter you prefer. If I am looking to purchase low quantites of numerous different products like commercial mailboxes, soap dispensers, hand dryers, etc..can you give me a volume discount? USA Building Supplies will be happy to provide you with a quotation for all of the products you are looking for. Many of our products come from different manufacturers therefore it is difficult to say what pricing we can give you without knowing specifically what you are looking for. I want recess mount three cell phone cabinets side by side, can you provide me with a shop drawing? USA Building Supplies is happy to provide you with a side by side drawing of the cell phone cabinets you are looking to possibly purchase free of charge. Can I recess mount a 4C horizontal mailbox into kiosk outdoors? Yes, 4C horizontal mailboxes are warranted for indoor and outdoor use. Contact a USA Building Supplies representative and he or she will be happy to help you with design of your mail center and shop drawings free of charge. Can I get a cluster box units in an anodized aluminum finish? No, at this time the Postal Service has strict guidelines concerning the manufacturing of cluster box units. Can I surface mount my cluster box unit to a wall? USA Building Supplies does not advise clients to surface mount cluster box units to a wall and it will void your manufacturer's warranty if you do so. We would suggest that you look at a 4C mailbox with a surface mount collar for your application. Can I get the decorative cap and pedestal cover in a different color than my cluster box unit? Yes, please specify the colors desired of each decorative accessory and the cluster mailbox when ordering. Decorative cluster box unit accessories are assembled in the field. Is assembly required for your pedestal mailboxes? Pedestal mailboxes nearly always ship in two boxes with one being the mail receptacle and the other being the pedestal. Minor assembly is required by the customer to get it ready for installation. If your commercial mailbox is for U.S. Mail delivery the USPS will need to come out and install their postal arrow lock where needed. Is the pedestal parcel locker a two door mailbox? No, parcel lockers are designed for U.S. Mail delivery of packages and have a unique dual locking system. Typically, package lockers work in conjunction with a commercial mailbox. Is the mail and package drop rear or front access? The mail carrier delivers the mail to the front of the mail and package drop. The postal customer can get the mail through the front or the rear of the locking mailbox. Both customer access doors are keyed alike for simplicity for the client. What is the thickness of the houseart numbers and letters? Houseart numbers and letters thickness without standoffs is 1/16". Houseart building numbers and letters thickness with standoffs is 7/16". After years of use the horizontal mailbox front panel fell off when the mail carrier was delivering the mail, can I get a new gate? USA Building Supplies advises clients who have this happen to a horizontal mailbox to replace the unit. A new front panel could be purchased, but when you take into account assembly costs it typically exceeds the cost of a new postal mailbox system. For security reasons I just changed the apartment building I own over to a locked lobby but I need to give thae mailman the ability to enter the lobby, can you help? Yes, USA Building Supplies can help, and would advise you to purchase a key keeper with USPS access which is specifically designed for this purpose. I ordered an Elephantrunk drop box and it wiggles slightly on my porch, is there a way to solve this issue? The Elephantrunk parcel drop box comes standard with leveling feet for minor adjustments. Adjustments should be made before bolting down the package drop box. Please refer to the installtion instructions if more specific information is needed. Can mail master mail sorters be stacked? Yes, mail master mail sorters can be stacked when modules are of equal width and depth. If ordering the mail sorter modules at one time please indicate which units will be stacked, and the factory will drill holes and provide screws to ensure stable stacking. USA Building Supplies also advises clients to not stack the mail organizers too high due to obvious employee ergonomic reasons. I ordered a Tek Stak laptop locker with electronic locks and need master access to each compartment, can you provide that? Tek Stak laptop lockers with electronic locks purchased from USA Building Supplies are all provided with a master code free of charge. Do you carry a USPS Approved commercial mailbox which the individual compartments hinge at the bottom? No, currently there is not a commercial mailbox in the marketplace that is USPS Approved which the compartments doors hinge at the bottom. What type of cell phone locker is better, the master keyed unit or the entry panel cabinet? A metal number decal fell off my cluster mailbox, can I get a new one? Yes, from what you are describing it appears you will need a photo metal id tag, that is typically used on cluster box units and 4C mailboxes. Please call USA Building Supplies national customer service center for assistance. Is there a pedestal spreader available for a 4C pedestal mailbox so I can mount mount two units on one pedestal? No, a pedestal spreader is not available for 4C pedestal mailboxes. What is the largest USPS Approved vertical mailbox you offer? Currently, per USPS regulations the largest vertical mailbox is seven doors. Can I get a key for the postal arrow lock from the Post Office for my pedestal mailbox? No, the Postal Service will not provide keys for the arrow lock due to security reasons for your pedestal mailbox. Does the Oasis locking mailbox have an area for outgoing mail? Yes, the Oasis mailbox has a clip on the inside of the hopper door that will about a dozen outgoing mail letters. I lost my keys for my courier drop box, what should I do? Call USA Building Supplies' national customer service center and order a courier box lock. The lock that is currently installed in the courier drop box will have to be drilled out before the new lock can be installeded. Do you carry a single unit locking mailbox that is postal approved with secure outgoing mail? Postal regulations prohibit outgoing mail to be locked in a single unit locking mailbox. Can the factory cut slots into each user door of the cell phone locker I want to purchase? Yes, the factory can cut slots into the doors of your cell phone locker. Typically there is an up charge for doing this modification. Please contact USA Building Supplies national customer service center for more information. Which anti-fatigue mat do you suggest for employees who are sorting mail? USA Building Supplies suggests that you take a look at either the Airug or Blade Runner anti-fatigue mat. Do most people order the one or two tag system key control cabinets? Most people prefer the two tag key control cabinets. Which anti-fatigue mat do you suggest for a pharmacy counter area? USA Building Supplies suggests that you look at any of the Marble-Sof-Tyle anti-fatigue mats. How do your outdoor recycled plastic message centers hold up in comparison to wood units? USA Building Supplies' recycled plastic message centers have time and time again outperformed wood units in the harshest of climates. Can I use a horizontal mailbox outside? Horizontal mailboxes are warranted for indoor use only. However, in more friendly climates USA Building Supplies does have clients that use horizontal mailboxes outside. Can you build a parcel locker into a vertical mailbox? No, package lockers cannot be built into vertical mailboxes.